Mumbai 23rd September, 2018: Congenital Heart Diseases (CHD) impact over 8 in every 1000 newborn children in India, the Paediatric Cardiac team at SL Raheja aims at effectively identifying, screening and providing corrective treatment to these children, in conjunction with socially responsible stakeholders. The program is based on the understanding that babies born with the congenital defect are subjected to various health complications later in life; many don’t even make it. Their parents would be counselled to consult a Pediatric Cardiologist and undergo a 2D Echo, free of cost, for which special arrangements have been made at the hospital. The two-day initiative was graced by Hon. 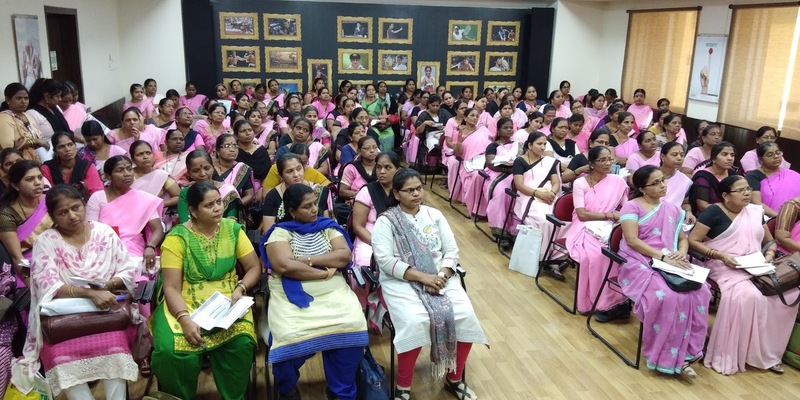 Mrs. Shobha Shelar, Child Development Project Officer, Brihanmumbai Municipal Corporation, who leads the Aanganwadi program. These Sevikas who engage with over 4500 children on daily basis, will work as guardians of health by helping spot symptoms amongst their wards. Dr Bhushan Chavan, Pediatric Cardiologist hosted this engaging session with the Sevikas. Speaking about the initiative undertaken by the hospital, Dr Bipin Chevale, Zonal Director, SL Raheja Hospital, Mahim – A Fortis Associate said, “Awareness about CHD needs to be built amongst those who directly come in contact with children. The Aanganwadi project is such, where these Sevika’s work tirelessly to ensure malnourished kids receive the necessary nutrition they need. Dealing with over 4500 children, enables to identify those who likely stand at a risk. We are proud of this association that will help strengthen the cause of child health”. Commemorating the initiative, Hon. Mrs. Shobha Shelar, Child Development Project Officer, Brihanmumbai Municipal Corporation, said, “Our association with the PaedCardiac Team at the hospital has empowered us with knowledge about Congenital Heart Diseases, it will help us work better as caregivers for the thousands of children we work with on a daily basis. Equipping our team with skills to tackle emergencies by deploying BLS and CPR, is definitely a huge plus”. In its endeavor to diagnose the disease early, amongst the city’s children from disempowered backgrounds, the hospital also conducts a free 2D Echo test and Paediatric consultation, every Saturday, on its premises.